Ulnar neuritis is an inflammation of the ulnar nerve as it passes on the inside of the elbow down to the forearm and hand. It can also be known as ulnar nerve compression or cubital tunnel syndrome. It is common in throwing athletes, although it can be seen in active people and even non-active people. People with irritation or compression of the ulnar nerve will often notice numbness and tingling in their ring and little fingers with activity or even at rest. Occasionally the athlete will notice soreness or a dull pain on the inside of the elbow and forearm. In long-standing symptoms, weakness with grip in the hand can be noted. A sports medicine physician often can make this diagnosis by physical exam in the office. Tapping the ulnar nerve as it lies just behind the bony process on the inside of the elbow (people often think of it as hitting the “funny bone”) will reproduce the symptoms. Tapping the nerve can cause a pins and needles sensation on the inside of the elbow or down into the fourth and fifth fingers. Also weakness with grip can be noted as well. The physician will also check for other causes of medial elbow pain as well as instability to valgus stress, which could signify ulnar collateral ligament deficiency in a throwing athlete. X-rays are usually unremarkable, but physicians often order nerve conduction studies. These are studies that test the action of nerve signals. These tests can identify compression of the ulnar nerve and where the nerve is compressed to help plan treatment. Initially, rest or avoiding offending activities, anti-inflammatory medications, and the patient’s wearing a night splint can be attempted. Long-standing or significantly disabling cases often require surgery. Surgery can simply involve decompression of the nerve on the inside of the elbow. Occasionally moving the nerve in front of the medial epicondyle is needed, especially if the athlete has a snapping sensation where the nerve slides back and forth across the medial epicondyle area. Return to sports depends on resolution of symptoms and the type of treatment needed. If it resolves without surgery or with a simple decompression, return to sports can be fairly quick. Transposition of the ulnar nerve often requires a longer period of time to get back to sports. If symptoms resolve, return to sports at the same or higher level is likely. 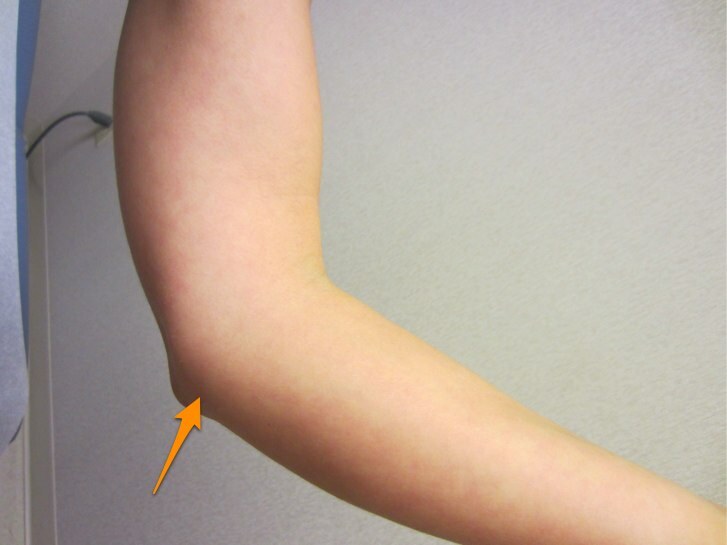 The ulnar nerve runs behind the medial epicondyle on the inside of the elbow (orange arrow). This program offers a comprehensive Q&A collection on biceps tendon ruptures, tennis and golfer's elbow, Tommy John surgery and more.